Reports are surfacing that Rodrigo Damm will step in on less than seven days notice to take on Gilbert Melendez this Saturday at Strikeforce’s “Shamrock vs. Diaz” event. Despite earlier reports that Lyle Beerbohm would sub in for injured lightweight champ Josh Thomson, The Fight Network confirmed that it will be Damm that takes on El Nino. Damm is a Brazilian jiu jitsu specialist that has amassed an impressive 8-2 record. In his last outing seven months ago, he took Eiji Mitsuoka’s back and forced him to tap via rear-naked choke. Although Melendez desperately wanted to redeem himself against the man that jacked his title last June, he is just as anxious to get back in the cage to show MMA fans that he is deserving of not just owning the Strikeforce title again, but that he is among one of the world’s best 155-pounders. 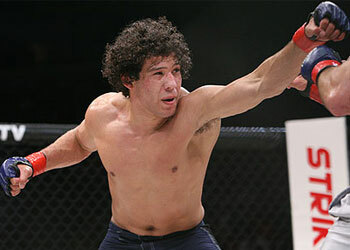 After winning his first 13 scraps, Melendez has dropped two of his last three.